First step for a new Learning2Fly participant: go to the Learning2Fly online store and scheduler and create a Learning2Fly studio account for yourself, or log in with your Facebook credentials. You will be prompted to login with Facebook, or create a new account. Returning members can login using previously created crendentials. Complete all fields in the Create an Account form. Each class participant needs to create an account. It is necessary to complete this form as it also serves as the Studio Liability Release form that we require for participation. 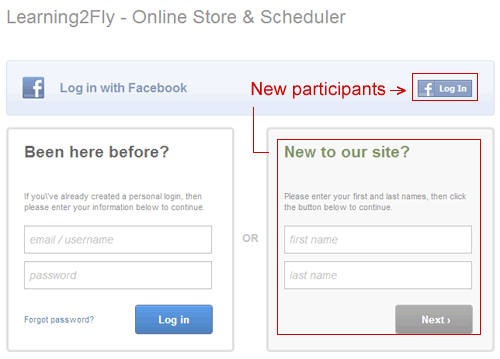 Once an account is created, you may then use the login and password to enroll in any of the Learning2Fly classes.